Part two of Best Foods for Fit Eyes and Great Vision. This is a continuation of the prior article on foods and vision. I attended a seminar recently where the speaker related a story of a man who was about to go blind and was able to restore much of his vision through a profound change in his diet. The story is that this man went on a diet containing nothing but raw spinach, yellow corn, carrots and goji berries for one month. After this month his sight had improved. I cannot vouch for the accuracy of the story (and I don't recommend raw spinach -- cooked kale is superior), but it did inspire me to update my prior article on the best foods for the eyes and vision. In that article I neglected to mention goji berries and no discussion of the best foods for the eyes would be complete without mentioning this super food. Goji berries are one of the most nutritionally rich foods overall. In addition to the very important carotenoids, they contain vitamins C, B1, B2, B3, B6, vitamin E, over 30 essential minerals and trace elements, polyphenolic antioxidants and 19 amino acids. Goji berries contain 112 mg calcium per 100 gram serving, providing about 8-10% of the Recommended Daily Intake (RDI). They contain 24% of the RDI (1132mg/100 grams) for potassium. Goji berry delivers 100% of RDI for iron at 9 mg/100 grams making them one of the best sources of iron. Goji berries are a good source of zinc. They provide 20% of the RDI for zinc. According to the Handbook of Nutrition and Ophthalmology, "the retina and choroid contain the highest concentrations of zinc of any tissue in the human body. Zinc plays an important role in eye health, and recent investigations have demonstrated a causal link between zinc status and age-related macular degeneration." 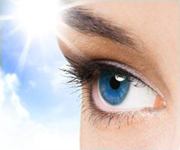 Selenium is another nutrient known to be important for the eyes. 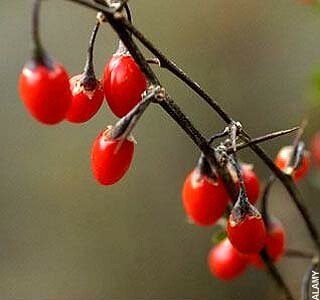 Goji berries have an unusually high concentration (50 micrograms/100 grams) -- nearly 100% of the RDI. The vitamin C content in dried berries ranges from 29mg to 148mg/100 grams. (My assumption is that "fresh" berries provide even more -- as much as 100% of the RDI, I am told. I believe I have located a source for fresh goji berries and I will report further after my order arrives.) Even at the lower estimate for dried berries, they still provide 35% of RDI. Beta carotene. A carotenoid pigment in orange-red foods like goji, pumpkins, carrots and salmon, beta-carotene is important for synthesis of vitamin A, a fat-soluble nutrient and antioxidant essential for normal growth, vision, cell structure, bones and teeth and healthy skin. Zeaxanthin. Goji berries are an extraordinary source for this carotenoid important as a retinal antioxidant and pigment filter of ultraviolet light. Goji berries contain 162 mg/100 grams. Lycopene. Unknown previously as a constituent of berry fruit, lycopene in powder made from goji juice concentrate has been measured at 1.4 mg/100 grams (contracted assay, UBE Analytical Labs). As lycopene's antioxidant role as a possible cancer-inhibiting agent occurs at microgram blood levels in humans, this is a potentially important discovery inviting further research. Polysaccharides. Long-chain sugar molecules characteristic of many herbal medicines like mushrooms and roots, polysaccharides are a signature constituent of goji berries, making up 31% of pulp weight in premium quality goji berries. Polysaccharides are a primary source of fermentable dietary fiber in the intestinal system. Upon colonic metabolism, fermentable or "soluble fibers" yield short-chain fatty acids which are valuable for health of the colonic mucosal lining, enhance mineral uptake, stabilize blood glucose levels, lower pH and reduce colon cancer risk and stimulate the immune system. Polysaccharides also display antioxidant activity. Phenolics. Also called phenols or polyphenols, this group of phytochemicals numbers in the thousands of individual chemicals existing across the plant kingdom, mainly as protective astringents or pigments that give bright colors to plants like the red, ripe goji berry. Phenolic pigments have the metabolic property of high antioxidant capability transferable to animals by eating the plant. New assays have demonstrated the presence in goji berries of phenolics such as ellagic acid (86 mg/100 grams) and p-coumaric acid, with a total phenolics content of 1,309 mg/100 grams -- one of the highest values for any plant food yet tested. It is important to get zeaxanthin and lutein together - make sure your diet includes plenty of both these carotenoids. In fact, there are hundreds of carotenoids and research suggests that taking just one (or a few) as supplements might cause imbalances or deficiencies of other important carotenoids. Therefore, I do not recommend using supplements that contain isolated carotenoids -- just eat super foods such as those listed on FitEyes.com. Now that I have repented for neglecting goji berries in my previous article about the best foods for healthy eyes and great vision, I would like to briefly touch on some other important foods. I am going to recap what I said about kale because I still rank kale at the top of the list of important foods for the eyes. Other important greens include fresh parsley, collard greens, mustard greens. As mentioned above, some people also recommend spinach -- even raw spinach. I do not recommend raw spinach, although I do know this is a controversial topic. We could argue the merits of cooked vs. raw spinach for decades. However, I choose to settle that argument by referring to the ancient wisdom of Ayurveda. According to Ayurveda, it is better to eat vegetables cooked because this improves digestion and good digestion is the foundational key to great health. Yellow corn is another food many people recommend for the eyes. Many yellow and orange vegetables are good. Orange bell peppers, for example, contain three times more zeaxanthin than almost any other food. Other good choices are carrots and pumpkin. In addition to goji berries, blueberries and bilberries have a long history of folk medicine use in healing the eyes. There is some research to support their use. I mentioned olive oil in the prior article, but many people are also recommending hemp seed oil. I do not like the fact that hemp seed oil contains more than twice as much omega-6 fatty acids as omega-3. Flax oil contains four times as much omega-3 as omega-6, making it a better compliment to the unbalanced omega ratio in the Western diet. In my opinion, any foods or dietary approaches that are good for the liver will also prove beneficial to the eyes. The liver and the eyes are linked in Traditional Chinese Medicine, so you might want to consider a diet-based liver cleanse. I will also mention that ancient healing practices for the kidneys would also be of interest in glaucoma in my experience. The emotions that elevate intraocular pressure also affect the adrenal glands and these glands sit right on top of the kidneys. Ancient medical systems group the kidneys and adrenals together, so a kidney-strengthening routine from Ayurveda, for example, is something I recommend to anyone who has elevated intraocular pressure that they feel could be correlated with stress.